Written by: Joyce Er (15A01A), Marcus Tan (15A01A), Christine Saw (15A01A) and Martin Lim (15A13A) Additional Photos by: Hugo Tay (15A01A) and Raffles Community Advocates From the 15-17th of April, Raffles Community Advocates (CA) rolled out the inaugural Heartware, in their bid to raise awareness on the serious issue of poverty in our society and around the world. Instead of merely having No Shoes Day as per tradition, this year the graduating batch of CA decided to address the issue of poverty more holistically, starting with the individual before branching out to the community and to the world. With the aim of cultivating empathy and inspiring Rafflesians to reflect on the privileged lives we take for granted, the Organising Team organised a series of events from the 15-17 of April, in the hopes that students could experience poverty for themselves. Heartware 2014 commenced with Try It! : $3 Food Challenge. Participants were encouraged to limit their food spending money for the day to $3, an initiative which bore similarities to the ‘$5 challenge’ that gained popularity and attention in Singapore late last year. In the $5 challenge, Singaporeans pledged to cap their spending on food and transportation to a mere $5 a day so as to be able to better empathise with Singaporeans who face such impediments living on a $1500 income. 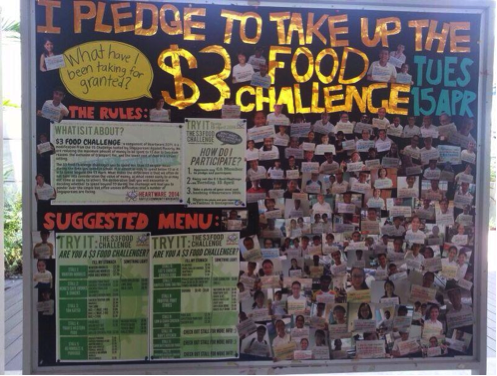 Similarly, the $3 challenge aimed to encourage fellow Rafflesians to get a taste of the constraints and discomforts of food poverty. 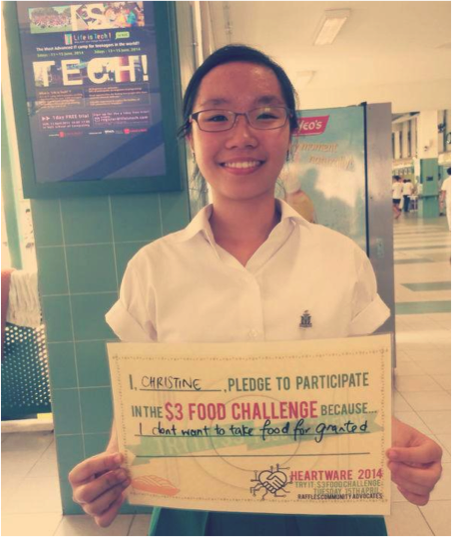 When asked about the purpose of the challenge, Daniel Hakim (14S06F), the head of the Organising Team for Heartware 2014 remarked, “It’s not about going hungry […] it’s about appreciating the value of $3 such that you will be able to spend wisely on your food.” Students were encouraged to pledge their commitment to the challenge by writing their reasons for doing so on placards. Pictures of students holding up the placards were displayed on a board along the canteen walkway and featured in a video screened in the canteen. One of our writers decided to take part in the challenge as well. The challenge was labelled by many as a difficult one. While many students excitedly pledged to commit to the challenge, a number found themselves unable to complete it and eventually succumbed to the persistent growls of their stomachs. Not only did students find it tough to last the day on the significantly smaller amount of food that $3 could get them, they also faced the inconvenience of having to consider the value of food items down to the very cent. Day 2: See It! Behind Closed Doors One-Room-Flat Exhibition Heartware continued on the second day with “See It! Behind Closed Doors”, where a one-room flat exhibition was conspicuously set up in the canteen walkway. The intention was to bring the struggles of the poor right to our doorstep, while concurrently publicising REACH Singapore’s home refurbishment volunteer activities. Singapore’s shiny facade belies its income inequality, currently the highest amongst OEDCs, such that, as Daniel Hakim explained, “poverty in Singapore may not be obviously seen”. Although it was not to scale, the exhibition clearly demonstrated the cramped living conditions which the underprivileged have to face on a daily basis, even in a country at the pinnacle of economic prosperity. 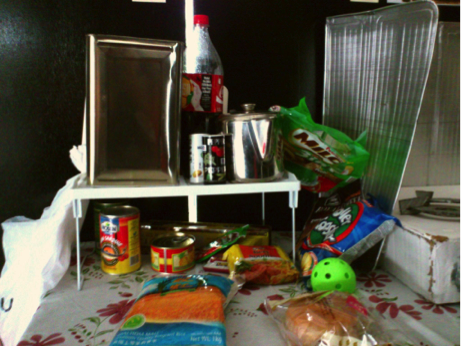 A table displaying an assortment of cheap but unhealthy foodstuffs, which can typically be found in a one-room flat. The not-to-scale mini-exhibition served its function by creating an illusory sense of claustrophobia even in the wide canteen walkway, which undoubtedly proved to be a novel experience for Rafflesians. A table piled with cheap foodstuffs like milo packets and biscuits took up about a third of the space. In addition to this table, the tiny space was further crammed with a study desk and a blanket meant to indicate a sleeping area. 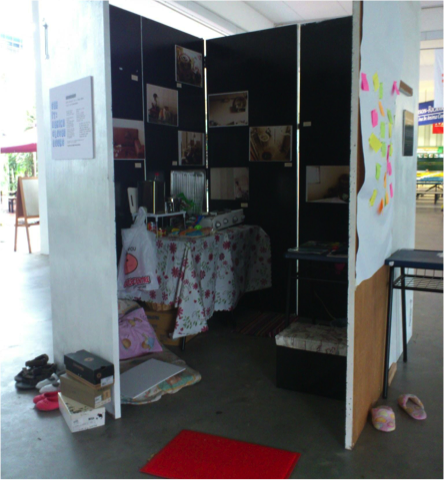 Photos of one-room flats which CA helped to clean up were displayed on the walls to show visitors the reality of living in such flats in Singapore, and students who wished to view those on the far end of the exhibit were forced to squeeze in. The rest of the wall space was covered in infographic posters about poverty in Singapore. Students who visited the exhibition were encouraged to pen down their thoughts on Post-It notes which were then put up on a cork board inside the exhibit, as well as on its exterior. The majority of post-its expressed approval of the exhibit, such as one that said the exhibition was “very meaningful and insightful in showing us the living conditions of our fellow Singaporeans [which] we otherwise would not know about”. Similarly, another said the exhibition “opened my eyes to the harsh reality in Singapore and inspired me again to remember to be grateful and stand up for the needy”. For such individuals, the exhibition clearly confronted them with the stark reality of poverty and inspired them to reconsider their own privilege, fulfilling CA’s intended outcomes. At the same time, the exhibition had its detractors, with one post-it arguing that the exhibition was an “unrealistic representation of a one-room flat” and an “exaggeration”. Admittedly, the exhibition had its limitations; one could hardly expect CA to reconstruct an entire flat in the canteen, and stepping into a small space for a couple of minutes makes a mockery of the experience of the poor. However, the intention of the exhibition was not to replicate, but to simulate, and in doing so provide an opportunity to step into the shoes of someone less fortunate. However, ‘See It’ appeared to be limited in its attempt to inspire students to sign up if they were interested in future home refurbishment activities. When we last checked on Saturday, there were only four signups expressing interest in future home refurbishment activities. When asked if she noticed the signup sheet, Sandra Faith Tan from 15S05A highlighted, “If it was on the table outside the exhibition, the table was strewn with loose papers and post-it pads,” which may have obscured the signup sheet. The exhibition had unrealised potential to engage and inspire students and perhaps there could have been better organization and more conspicuous positioning. For an inaugural run, the one-room flat simulation appears to have been well-intentioned, but to increase its effectiveness, it could have been executed more thoroughly, with greater attention paid to detail. A Y5 who has requested to remain anonymous praised the visual component of the exhibition, but felt that ‘it could be much more improved through other senses like taste, smell and touch’ for a more comprehensive and convincing sensory experience. That same day, a talk was also held to help establish the right attitude towards the final instalment of Heartware, Feel It! No Shoes Day. Over the past two years, this has been held alongside the Shoe Collection Drive that CA holds in partnership with the Tana River Life Foundation (TRLF). This is a charitable organisation situated in Kenya, which aims to provide dignified aid to marginalised locals. 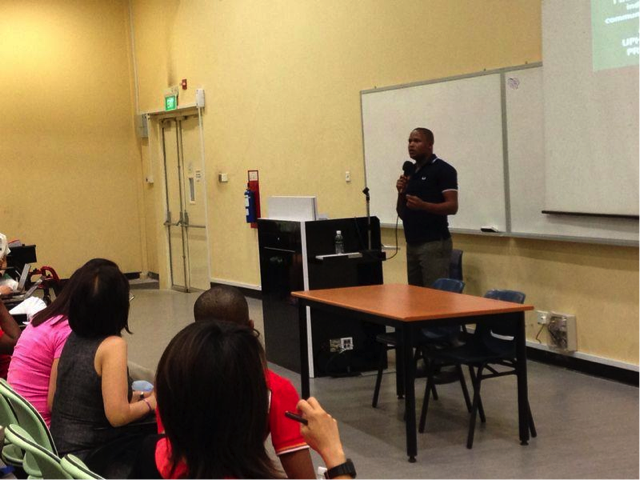 The talk was conducted by Rafflesian alumnus and TRLF founder, Mr Gabriel Teo, about his organisation’s schemes and the ethics he believes should underpin any acts of social service. He was accompanied by three Kenyan youth beneficiaries of TRLF’s programmes, including the Mitumba Project which the Heartware shoe collection drive is contributing towards. 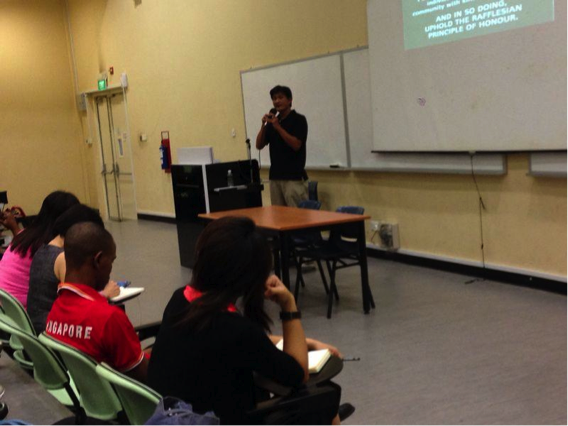 Mr Gabriel Teo spoke about TRLF’s aid schemes and the principles underlying TRLF’s work. After touching on schemes geared towards subsidizing education for Delta students, Mr Teo provided detailed information about the Mitumba Project, which is behind Heartware’s Shoe Collection Drive. Mitumba, or ‘recycled goods’ in Swahili, is a microfinance scheme set up in 2004 and one of TRLF’s entrepreneurship courses. In addition to shoes, Mitumba also collects clothes and bags, which are then sorted and either sold or used for the course. The microloan scheme, essentially a form of repackaged financial assistance, operates over 4-5 months. In the first month, 100 pieces of clothing and 20-30 pairs of shoes are loaned on good faith to interview-selected applicants, mostly women with dependents such as children studying in secondary school or with chronic disease. Participants market and sell their wares to locals for about 400-500% profit. The sale of all their shoe stock, with a pair going for approximately $4.20, can pay for about a term’s school fees. In the subsequent months, they repay their loans and purchase more stock to sell. Participants must remain accountable, presenting monthly receipts accounting for their income and expenditure. Eddie, a Kenyan youth beneficiary of the Mitumba Project, is proof that TRLF aid can be effective. In response to a question about the sustainability of a scheme in which TRLF still provided the shoe stock, Mr Teo clarified that Mitumba ‘is not intended to be a major source of assistance’, and practically only ‘gives them a boost’. The real intention, Mr Teo stressed, was to ‘preserve dignity as you assist, through dignified giving and dignified receiving’, as opposed to a condescending ‘beggars can’t be choosers’ attitude on this end, or a sense of passive dependence on the other. Heartware 2014 rounded off with Feel it! : No Shoes Day as the popular poverty awareness event returned for the third year running. Organized in collaboration with the aforementioned Tana River Life Foundation, the event aimed to raise awareness for the poor living conditions of the children in Kenya. 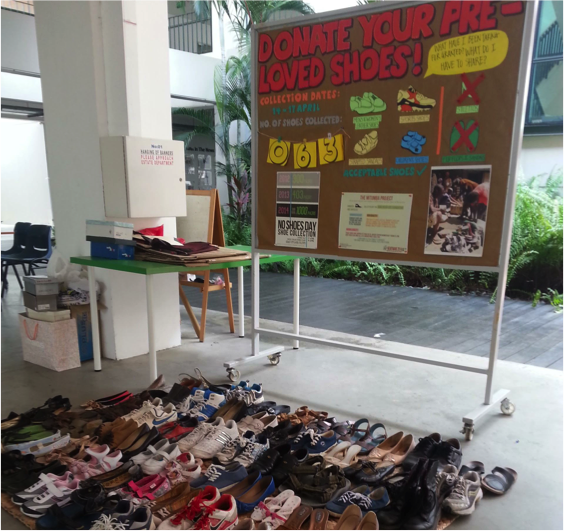 A sample of the 905 and counting pairs of shoes collected in this year’s Shoe Collection Drive, which have far surpassed previous years in number. There, millions of children are forced to go barefoot across treacherous terrain and risk painful abrasions, cuts and infections with every step they take – all this because they cannot afford a pair of shoes. While walking around without shoes in a clean, safe school compound is in no way an accurate simulation of their daily ordeal, this small act of sacrifice on our parts was intended to encourage participants to empathise with less fortunate children. No Shoes Day was also meant to encourage participation in the Shoe Collection Drive so as to raise funds for these Kenyan communities through the Mitumba Project, which encouraged students to donate their pre-loved shoes to the Tana River Life Foundation. In contrast, the children in Kenya have to negotiate much harsher terrain and the profundity of their difficulties may well be beyond our imagining. Those who willingly participated and grasped the risible contrast between conditions here and there are perhaps the ones who benefited most from the challenge. One such individual would be Natalie Chan from 15S03B, who reflected: “The grossest part was the toilets and the canteen floor, but even that is nothing compared to what the Kenyan children have to go through because they risk stepping on dangerous objects such as broken glass”. Some other students, like Ding YuChen, took the challenge several steps further by running their 2.4km item for NAPFA sans footwear. 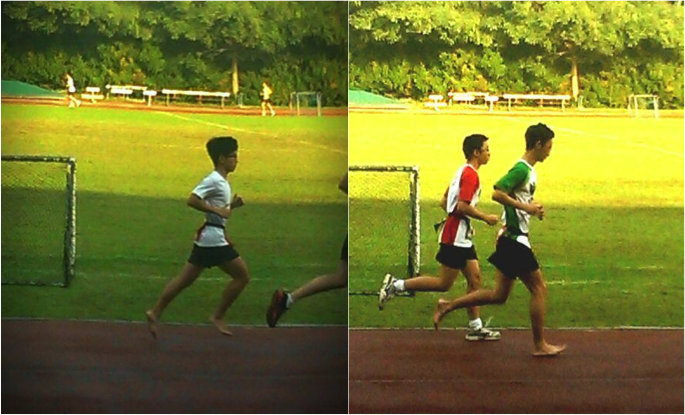 Two J1s resolutely running their 2.4km for NAPFA without shoes. While many people were seen walking around school barefoot or instagramming themselves with their friends that day, it can be hard to distinguish between successful advocacy and mere slacktivism, as the difference lies in the mentality behind the action. For those who participated by walking around school barefoot, their good intentions are to be commended,though it is important that they realise how much worse going shoe-less is for those in Kenya for the entire exercise to have been fruitful. As with the $3 challenge, the fact that we had a choice to participate only underscores our own privilege. Moreover, going around shoe-less for a school day was a small sacrifice to make. Indeed, No Shoes Day seemed to be a success because of the number of students who enthusiastically participated; yet, it remains to be seen how many took away the true meaning behind their dirty soles that day. 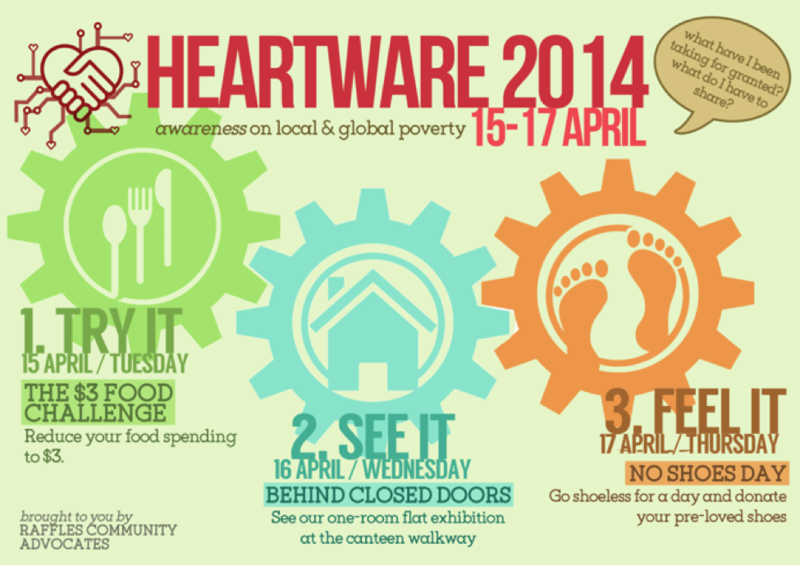 As a whole, Heartware’s thoughtfully planned, holistic experiencewas a welcome evolution from past years, where there was only ‘No Shoes Day’, and those who attempted each day’s challenges and experiences generally came away with a better appreciation of poverty. This year, however, controversy arose over the various events organised and numerous questions were raised over the kind of aid being provided and whether it would reach the very people we are trying to help. And perhaps that recognition and depth of thought is something encouraging for the Rafflesian community – after all, advocacy can only progress when we truly take ownership of it. While it is up to the reader to assess the impact of this year’s Heartware, credit has to be given to the Organizing Team, who began planning Heartware last October, for their hard work in conceptualizing and putting together the different events over the three days. For these dedicated organisers, their parting message to all participants is, “All in all we hope that everyone who participated in Heartware 2014 can better appreciate the little things we have around us and are more aware about poverty that exist both on local and global scale.” Hopefully, regardless of which side students take in the conundrum of slacktivism and spreading awareness, every student has grown at least a little more cognizant of the privileges they are fortunate to have.